Cardine, C. J. (2018). Carpetbagging America’s public schools: The radical reconstruction of public education. Lanham, MD: Rowman & Littlefield. Cochran-Smith, M., Stringer Keefe, E., & Cummings Carney, M. (2018). Teacher educators as reformers: Competing agendas. European Journal of Teacher Education, 41, 570-590. Robles, Y. (2017, April 5). Former Jeffco superintendent lands new job as leader of charter school network. The Denver Post. Retrieved from https://www.denverpost.com. Scott, J. & Holme, J. J. (2016). 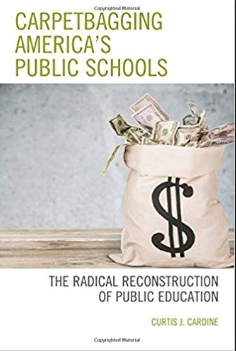 The political economy of market-based educational policies: Race and reform in urban school districts, 1915 to 2016. Review of Research in Education, 40, 250-297.